As of Wednesday, the Army Corps of Engineers reports the lake’s elevation at 676.93 feet msl (normal conservation pool – 659 msl). Sportsman’s White River Resort (870-453-2424) said the water is very high and swift. There wasn’t a single boat on the water near the resort last weekend. Berry Brothers Guide Service (870-453-2424) said the lake level at Bull Shoals fell 3.9 feet last week, but is still well above seasonal power pool. On the White, we had heavy generation this week with no wadable water. In an effort to lower the lake levels before the spring rains, the Corps of Engineers opened eight flood gates. The combined outflow and generation equal 30,000 cubic feet per second, the equivalent of 10 full generators. The hot spot has been Bull Shoals State Park. The hot flies were olive woolly buggers (sizes 8-10), Y2Ks (sizes 12-14), prince nymphs (size 14), zebra midges (black with silver wire and silver bead or red with silver wire and silver bead, sizes 16-18), pheasant tails (size 14), ruby midges (size 18), root beer midges (size 18), pink and cerise San Juan worms (size 10), and sowbugs (size 16). 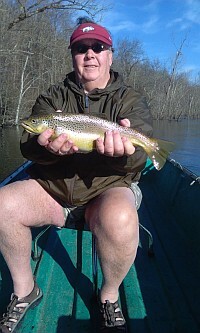 Streamer fishing has heated up with the high water. With the heavy flows, the fish have been pushed to the bank. The best bet for large trout has been to bang the bank with large articulated streamers delivered with heavy, 24- to 30-foot sink tip line. You will need an 8- or 9- weight rod. This is heavy work but the rewards can be great. As of Wednesday, the Army Corps of Engineers reports the lake’s elevation at 562.05 feet msl (normal conservation pool: September-April – 553.75 msl, April-September – 556.75 msl). Tom Reynolds of STR Outfitters said the quick drawdown will change the fish movements. The current has increased, so the fish will relate to that more than anything else. Look for them in the river channel of the lake. Stripers now can be anywhere from Robinson Point up to Mallard Point, and in the Howard Cove area. February is a hard month to fish for stripers. In normal years the first part of the month the pattern is the same as January, however with the high water, high water temperature for this time of year, and the lake draw down all bets are off on what and where the stripers will roam. They must feed, that’s one sure constant. Find the shad and you will find the stripers. As the month proceeds, the weather will turn warmer and we should start getting some south winds. That’s when the shad and stripers start moving. Start watching the water temperature and once it’s in the middle to high 50s, start moving up the creeks starting half way up. The shad will start moving and the stripers will follow. If we get a warmer period the second half of February the night bite will start.